Salted Caramel Pecan Chocolate Pie has an Oreo crust, a salted caramel pecan layer, and a thick chocolate ganache layer topped with sea salt! This pie recipe is the epitome of decadence! Since we basically missed the event (Averie was on my flight) we went out for drinks later that evening. Then I went to bed and got up at 4am for my flight home, where I got in at noon. I pretty much had no idea what time it was for days. My work travel is now over for 2016 and Thanksgiving is NEXT WEEK. Yes, you read that right. Are you still compiling dessert recipes? I sure hope so because I have 3 pie recipes that you have to add to your list. The first pie recipe for you is this Salted Caramel Pecan Chocolate Pie. It’s beyond insane. The rich fudgy ganache layer is perfect with just a sprinkling of sea salt. Salted caramel pecan chocolate pie is a GORGEOUS pie that will be the perfect accompaniment to any holiday table…or because it’s a random Wednesday and you need chocolate. There are so many amazing things about this pie. First, the crust. It’s an Oreo crust. 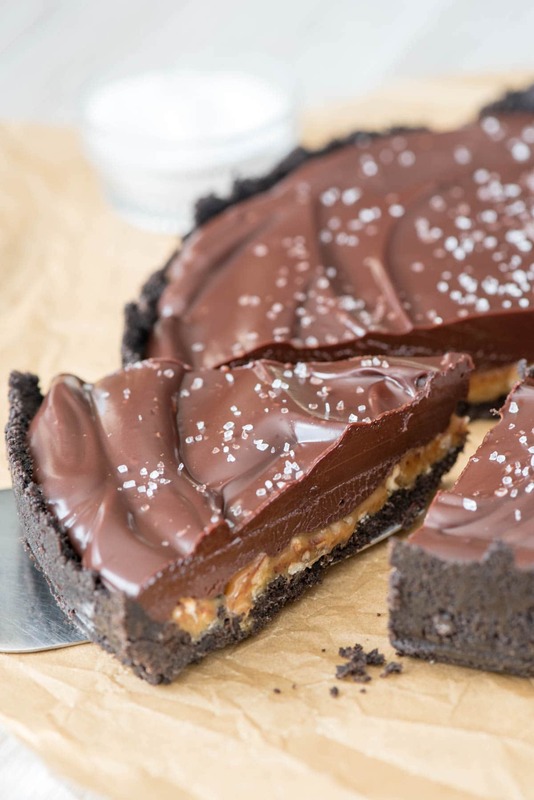 The chocolate of the Oreos is a must for the caramel and chocolate in the pie. This would also be delicious with a shortbread crust! Fun fact, I made this pie in a 9″ springform pan, like the Butterscotch Pie I shared over the summer. The removable sides make it easy to serve and slice the pie, especially if you’re taking it somewhere and don’t want to lose the pie plate. You can also use a tart pan with removable base or a regular old 9″ pie plate. Next, on top of the crust goes a salted caramel layer. I made this super easy by just melting caramel squares with heavy whipping cream. Then I stirred in toasted pecans and some Kosher salt to give it that salty sweet flavor. Adding the salt really does take the flavor up a notch. And then, last but certainly not least, the best part: the rich dark chocolate ganache layer. I used a dark chocolate chip (60% cacao) mixed with heavy whipping cream for a simple ganache. Use a good chocolate chip that you like best. Regular semi-sweet would work here too. To top it all off, a sprinkling of sea salt. When the rich sweet chocolate hits your tongue followed by the salt it is really a party on your tastebuds. I mean, just look at the sea salt on top of this pie. Doesn’t it scream gourmet? No one at your party has to know really how EASY it was to make. 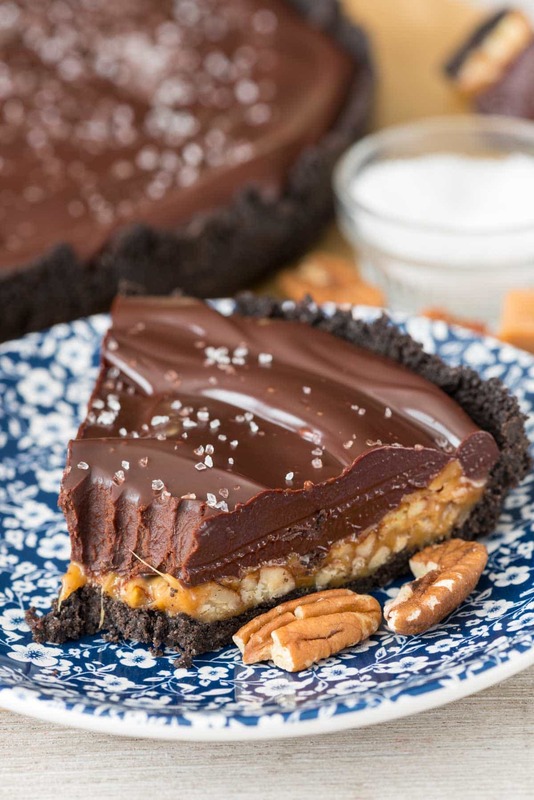 The crunchy crust, sweet and chewy caramel and pecans, and the thick chocolate ganache all combine for an epic and delicious WOW dessert. I know this salted caramel pecan chocolate pie recipe will be the hit of any party! Salted Caramel Pecan Chocolate Pie has an Oreo crust, a salted caramel pecan layer, and a thick chocolate ganache layer topped with sea salt! This pie is the epitome of decadence! Spray bottom and sides of a 9” springform pan with nonstick cooking spray. You can also use a 9” tart pan (with removable bottom) or a 9” pie plate. Stir Oreo crumbs and melted butter with a fork, then press into the bottom and 1” up the sides of the pan. (If using a tart pan or pie plate, press the crumbs all the way up the sides.) Chill until ready to fill. Place caramels and 4 tablespoons heavy whipping cream in a medium bowl. Heat on high power for 2-3 minutes, stirring every 30 seconds, until the mixture is smooth. Stir in salt to taste, then pecans, then spread evenly in the bottom of the pan. Place chocolate chips and remaining 1 cup heavy whipping cream in a large bowl. Heat on high power for about 1 minute 15 seconds, then whisk until the chocolate has melted and the mixture is smooth. Spread evenly on top of the caramel layer. Sprinkle the top with coarse sea salt and chill until set, about 2 hours. Store in refrigerator. Let sit on the counter for 10 minutes before serving. If you're using a springform pan or tart pan with removable base, remove the base from the sides while the pie is cold. CHECK OUT ALL MY PIE RECIPES HERE! Do you think milk chocolate chips would be okay? Yes they would work just fine! Enjoy! I substituted half and half for the heavy cream and added an additional half cup of chocolate to the ganache. So yummy! Thank you for sharing this recipe!